Boarding of the Renown can be at the Harbor Drive Hornblower terminal or at another location of your choice (additional docking fees may apply for remote locations). 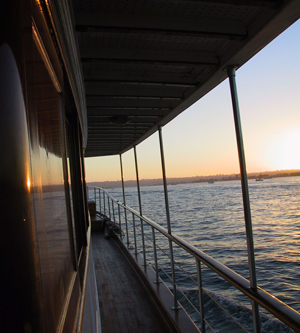 Typical San Diego Harbor cruises entail a relaxing bay tour featuring photographic points of interest such as the San Diego Skyline, Seaport Village, the USS Midway, Star of India, and the Coronado Bay Bridge. The Renown yacht by Hornblower is a classic motor yacht with enough space for up to 50 of your friends and family! 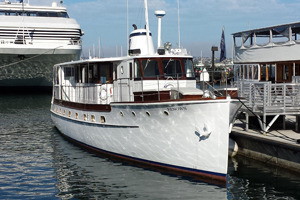 The Renown by Hornblower is a beautiful 72′ classic motor yacht. The main salon features a solid teak bar with all the elegant touches of hand-rubbed natural black walnut paneling which gives this yacht the authenticity of a gracious past. Renown provides her guests a main salon and dining deck which both provide panoramic views and an outside walkway around the entire yacht. Renown also offers a bar, dance area, private staterooms, and a stereo system to play your favorite tunes while cruising San Diego Bay with your wedding party, cocktail cruise, corporate event, or just about any other occasion that makes you want to just cruise into the sunset. 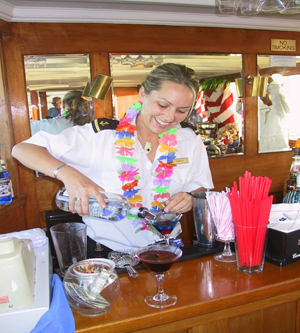 Whether you’re arranging a simple cocktail sunset cruise, or an elegant small wedding party, Renown can accommodate up to 30 guests for dining, or up to 40 guests for cocktails in a very comfortable and relaxing environment. 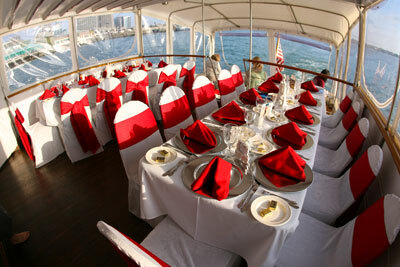 With teak trim throughout, seven foot ceilings, and Eisenglass windows that can be rolled up to allow the cool ocean breezes through, your event on the Hornblower Renown yacht will certainly be one to remember. 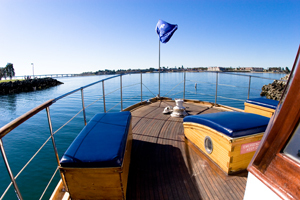 A San Diego Harbor cruise aboard the Renown is a fantastic way to celebrate any occasion! 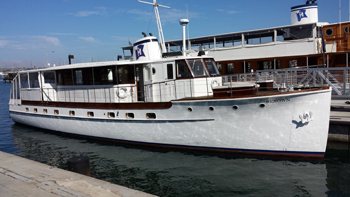 Whatever your occasion to charter a private yacht from San Diego Bay Cruises, the Renown motor yacht is ready to accommodate your event and your party. Renown comes equipped with all the comforts of home in a floating package of luxury. Salon with fully stocked bar and glassware ideal for socializing or meetings.